Sunny to partly cloudy. High 83F. Winds SW at 5 to 10 mph..
Simpleview staff are setting up shop in their new Oro Valley headquarters. 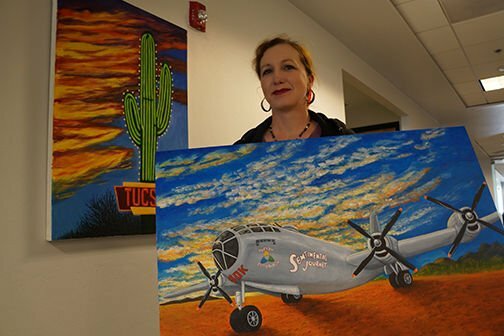 Simpleview employee Jocelyn Frazier painted two pieces of art capturing iconic Tucson images. The art now hangs in Simpleview’s Oro Valley headquarters. It may be the jobs story of 2018, and beyond, in Oro Valley. 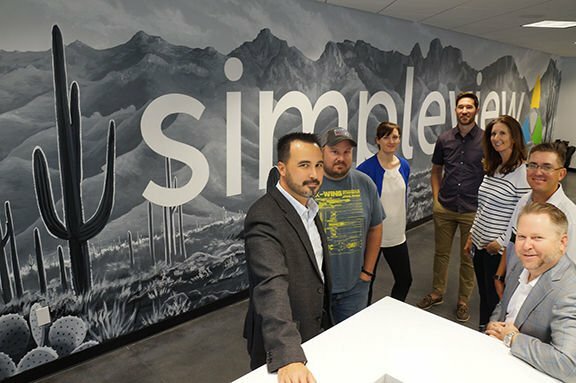 Last month, Simpleview moved the majority of its Tucson staff —185 people—to a 41,000-square-foot building at 8950 N. Oracle Road. It was previously the Pulte Homes building, a copper-clad structure on the east side of North Oracle Road toward Pusch Ridge. Today, it is Simpleview’s new corporate headquarters. It’s a big space for a growing company; Simpleview aims for 20 percent annual growth. Simpleview is a cutting-edge provider of customer relationship management, content management systems, web design and digital marketing initiatives for destination marketing organizations around the world. Visit Tucson is an example of a destination marketing organization. The company had previously been located in five suites in the La Cholla Corporate Center, just across the street from Foothills Mall. It also maintains offices in Pittsburgh, Pennsylvania, Oslo, Norway and in Mexico City, as well as remote locations across the country. What makes the Simpleview story more compelling is that it’s “local people making good.” Simpleview CEO Ryan George, Vice President of Finance Scott Meredith, Chief Technology Officer Bill Simpson and Vice President of Operations Sean Moyle attended Canyon del Oro High School in Oro Valley and grew up in Tucson. Moyle said he and George met on the playground in the fourth grade at Mesa Verde Elementary School. Years later, they and others are leading a company at the leading edge of the digital evolution. “I’ve never been tempted to leave, and I never will,” George said. So the new office—why Oro Valley? Great question. The decision was more luck than design, so the fact that such an incredible building was available at a time that we needed the space for growth was the primary factor. But as most of our staff looks forward to the move, they’ve started to discover how amazing a place Oro Valley is to live, work and play. One of my business partners and I happen to live in Oro Valley, and while it might be a bit of a trek for some, I would also venture to guess that many will move to the area given the amazing schools, natural beauty, and amenities that I’ve been lucky enough to see develop over the past 40 years. I believe the Town of Oro Valley has done an excellent job of building just that sort of a place and we can’t wait to bring our business, staff and visitors to the community. Do you ever feel Tucson is just too small for your growing company, or were you ever tempted to relocate elsewhere (more of a “tech” town maybe)? In other words, what’s kept you in Tucson? I’ve never been tempted to leave, and never will. Talk to me about some of the advantages of the new office. More of the company under one roof. More conference space. More open atmosphere. More natural lighting. Gym nearby aligns with health initiatives. The points above are spot on, but taking it a step further, Simpleview’s mission is to provide an environment where caring for others, quality, productivity and accountability drive profit, innovation and service excellence. You network with a lot of people from a lot of different places at Summit. In your experience, what do they think of Tucson? Or, tell me a story about an out-of-state or out-of-country customer who was impressed with Tucson. Do you think Tucson (or Phoenix) could ever become perceived as a tech hub, perhaps not at the level of San Francisco, but as a known locale for innovative technologies? I think it is fair to say that Phoenix is already held in this regard and the strong history of great companies like Hughes Aircraft, Burr Brown, and AOL’s past presence in Tucson echo throughout our community and support the fact that we are a tech hub. Dave Perry is the Greater Oro Valley Chamber of Commerce President and CEO.